Piping at the launch of Ceilidh Culture 2012 - Edinburgh's traditional arts festival! On behalf of the City of Edinburgh Council! Ceilidh Culture Launch on the BBC News - February 2012!! 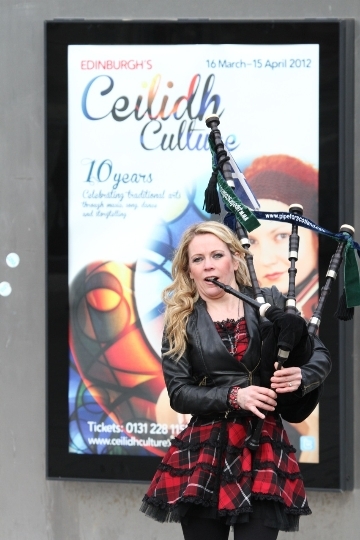 If you click on the following link you will see and hear me piping on the BBC News at the launch of the 10th Anniversary of 'Ceilidh Culture' at the Usher Hall, Edinburgh! Enjoy! In fact you can see us all in action on the following link - just press the Play button on the Johnnie Walker Pop up Gallery below!! Enjoy! If you log on to my family website www.vippiper.com - 'Home page', you will be able to hear me playing some tunes I have written for the pipes and whistle. Please click on the link below to see and hear me play the pipes at the launch of Edinburgh's 'Ceilidh Culture 2008', which was broadcast on BBC Scotland. Playing at Antoine's leaving party. At the famous 'Royal Oak' in Edinburgh during a folk session! 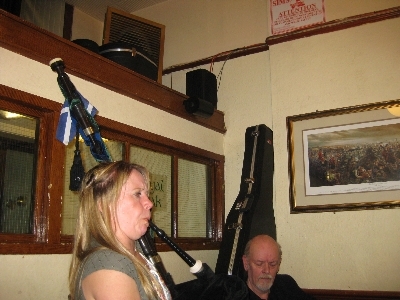 Piping at Antoine's leaving party at 'The Royal Oak' in Edinburgh, June 2009! Antoine was a chanter/bagpipe pupil at www.scotsmusic.org where I teach and he managed to get on to the pipes from beginner's chanter and play at a parade in Edinburgh, all under a year! Fantastic Piper! This was the night before Antoine returned home to France and we got a bit of a session going as you can see in the attached u-tube link!!!! 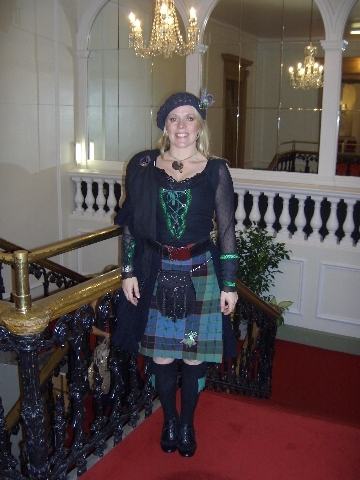 Performing as the 'Pink Piper' at the Edinburgh Moonwalk 2011!! Helping to raise awareness of breast cancer! This picture shows me dressed up as the 'Pink Piper' before performing on stage in the famous pink 'Moonwalk' tent in front of a 12,000 strong bra-clad audience of male and female moonwalkers - all raising much needed funds for breast cancer research in Scotland! Here's a clip of me piping after my performance on the streets of Edinburgh - cheering on the Moonwalkers as they take part in their half and full marathons in aid of breast cancer! !